A Conditional Flow has a condition assigned that defines whether or not the flow is used. A Default Flow is the default branch to be chosen if all other conditions evaluate to false. A Sequence Flow defines the execution order of activities. Types specify the nature of the action to be performed: Send Task, Receive Task, User Task, Manual Task, Business Rule Task, Service Task, Script Task. Markers indicate execution behavior of activities: Sub-Process Marker, Loop Marker, Parallel MI Marker, Sequential MI Marker, Ad Hoc Marker, Compensation Marker. 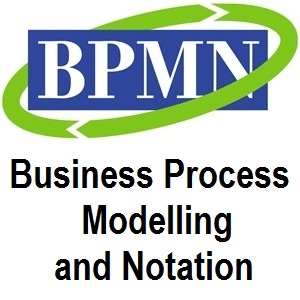 In BPMN, a Call Activity is a wrapper for a globally defined Task or Process reused in the current Process. A call to a Process is marked with a [+] symbol.